I was tagged by @borrowedtimeandspace​! And for my lesser-known wood sprite bae, Jiria. She is an only child and grew up wishing she had a younger sister. This was until her friend got a younger sister, and then she alternated between wanting to play with the sprout and wanting to avoid it entirely. It took her three tries to convince Bowman Leafwing to meet her without someone else around so she could ask him to court her. Their courtship is very lax and comfortable – when it’s not fiercely competitive. Jiria hasn’t won a race yet, but she’s hoping to someday. She considered training to be a knight, but decided she didn’t have it in her to hurt encroaching animals, as knights have to do from time to time. She stands at about 3.6 inches tall, and has a fairly athletic build from races. Her favorite food is hawthorn berries with honey drizzled on. Since Wellwood doesn’t have many hawthorn trees, it’s not often that she gets a chance at this. Bowman brings some to her from his patrols sometimes. The Petalkin surname is very old among the Wellwood sprites. 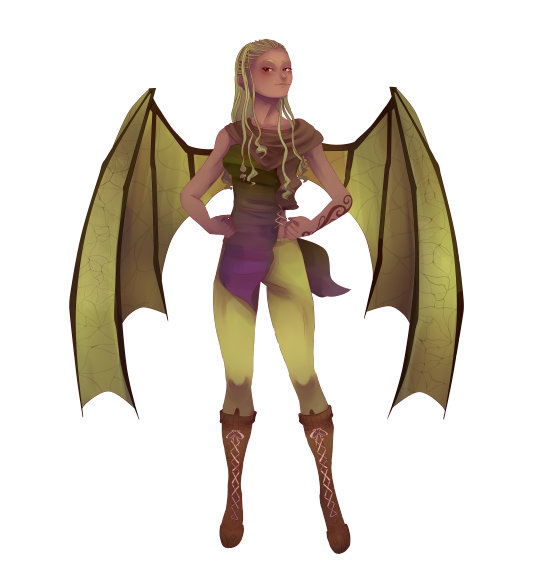 However, thanks to her brash attitude and flight-ready fitness, Jiria would not be categorized as a flowerkin, herself, the source of the name (a term for dainty or mild sprites, used for male or female sprites interchangeably). Flying higher than the canopy makes her nervous, but she does like to hide among the branches of the Big Oak to see out across the forest. Art by the-searching-one over on DeviantArt!